We have customers throughout the UK, however we tend to deliver to England and South Wales, and post our baskets to the outreaches. Please consult our map to see where your business falls. If you are still unsure please call to discuss with us. In some circumstances our deliveries may stretch wider than shown, depending on demand; but this cannot be guaranteed. The price includes baskets filled with well established plants. The price does not include a watering system. HOW MUCH IS A WATERING SYSTEM? A watering system costs £350 which also includes the timer. You do not have to have a watering system but they can make life easier for you if you are running a busy pub! DO I NEED TO DO ANYTHING ONCE I HAVE THE BASKETS? We try to make our service as hassle free as possible. 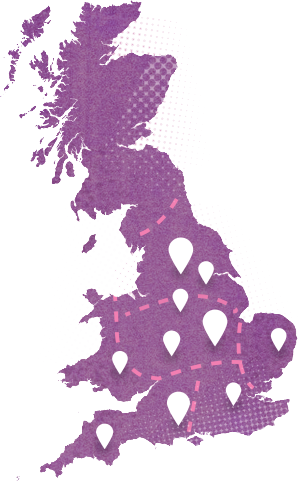 We will deliver and hang the baskets for you (as long as you are in the pink area on the map ie South of Wolverhampton). The plants will need watering regularly and so if you have opted to do this yourself this will need doing (in summer at least once daily, in winter twice weekly), and if you have had an irrigation system fitted then all we ask is that you check regularly that your baskets are being watered/ that the watering system isn’t broken. If you are concerned that it isn’t working properly please inform us ASAP to ensure your plants don’t wilt and die. Otherwise you just need to admire your blooming flowers and enjoy the compliments! HOW OFTEN DO THEY NEED WATERING? In the summer your plants need watering at least daily. You cannot water your plants enough over summer as our baskets are ‘free draining,’ this means that it is important to keep the compost moist at all times. Make sure that you pour water slowly into the basket so it wets the compost. In the winter you need to water at least twice a week. If the weather is icy we recommend no watering. If you have a watering system set up by us then you just need to check weekly that the system is working by checking that the bottom of the basket is wet/ the basket is heavy. IF THE WATERING SYSTEM BREAKS, WILL YOU FIX IT? Yes, if the watering system breaks we can come and fix it as early as our delivery diaries allow. We may ask you to cover the watering until we can get to you to minimise risk of wilting plants. We ask you not to tamper with the timers, and to check your baskets are being watered at least once weekly. CAN I CHOOSE THE COLOURS FOR MY FLOWERS? WHY SHOULD WE USE BLOOMING BASKETS OVER OTHER WHOLESALE FLOWER COMPANIES? We believe that we have delivered the highest quality beautiful flowers for over 25 years, and our hundreds of returning customers say the same! (See our customer testimonials section). Once you have placed your order you can be confident you are in safe hands. We are cost effective, reliable and do our utmost to please the customer. We know from experience common problems and ensure they happen to a minimum! Unlike other flower companies we use perennial flowers rather than annuals, which means that they flower all the way to the end of the season (summer flowers until early November). Many companies will supply baskets with flowers which tend to die after 6-8 weeks. We offer summer and winter plants which means your company or house can look beautiful year round. WHAT ARE YOU COLOUR SCHEMES? We change our colour schemes each year to make sure that we keep your company captivating your customers with appealing new looks each season. We try to choose hot colours in the summer and cooler colours through winter. Check out our gallery for some previous years colour schemes! Absolutely. If for any reason you are unhappy with your baskets, we will replace them. DO YOUR WINTER BASKETS HAVE FLOWERS? Yes we use plants which flower through the winter, although through December, January, February they are just green! WHAT HAPPENS IF MY PLANTS DIE? Your plants shouldn’t die and this only happens rarely. Generally this is if plants are not watered, or if the watering system is not working properly. This is why we ask you to check weekly and this is your responsibility. WILL THE WINTER WEATHER – FROST OR SNOW, KILL MY PLANTS? The frost shouldn’t kill your plants but we recommend not watering them at this time. WHAT DO I DO WITH THE IRRIGATION SYSTEM OVER WINTER? In mid December we recommend that you turn off your water system (don’t touch the timer, just turn off the tap! ), and then turn it back on again in mid February. Don’t forget to turn the timer back on! This is very important, and again this is your responsibility. This prevents split pipes due to frost. WHAT SIZES BASKETS/ WINDOW BOXES DO YOU DO? We have a large range of sizes to accommodate various types of buildings. Baskets range from 12″-24″ and window boxes of various sizes including made to measure. There are different options here. Quite often we will have supplied the pub before (even if for previous owners) and so we can recommend what will look best for your company. If not we generally recommend that pubs/hotels have 16″/18″ baskets and that homes have 14″. We tend to suggest that you have fewer but larger baskets as we find this looks the most appealing. Some places may already have brackets installed and this will predetermine the size of baskets you have. We are more than happy to discuss this on the phone, and depending on demand at the time of order we may be able to look at your pub ourselves. IS THERE A MINIMUM ORDER NUMBER? We ask that your order must be a minimum of £100. DO YOU DO FREE DELIVERY? Yes, delivery is included in all the prices. Yes, we do this frequently. DO YOU DO ANYTHING OTHER THAN BASKETS? Yes we do! Baskets, window boxes, tubs…. Anything in a container! DO YOU DO ARTIFICIAL FLOWERS? No, we only supply the real deal! We recommend real flowers over artificial (even though they may seem like less work!) as artificial flowers tend to fade quickly in sunlight and don’t last very long compared to real flowers, which grown and thrive looking even more beautiful in time.